Following a fine fun of five league games without defeat which had taken his side up to 9th place in League One, Southend manager Chris Powell opted to start with the same 11 players who began last Saturday’s 2-0 win at Gillingham against a Coventry side who began this match two points and three places behind them in 12th. On the subs’ bench Tom Hopper and Harry Bunn returned after injuries, whilst Jason Demetriou was back after being on international duty with Cyprus. Blues started brightly, putting together some decent passing moves and midfielder Timothee Dieng had an early effort which went just wide to the left of City goalkeeper Lee Burge. But the most controversial moment of the match came at the opposite end, with only six minutes on the clock. A Coventry corner was met by the Sky Blues ‘ Tom Davies, whose header looked to have clearly crossed the line but the linesman ruled that Southend’s Theo Robinson had stopped the ball from going in, so no goal was given. This resulted in huge protests from the Coventry players, one of whom was Michael Doyle who was shown a yellow card by referee Dean Whitestone. But the visitors did go in front with 20 minutes on the clock. Jonson Clarke-Harris paid on a Doyle corner for the unmarked Jordy Hiwula, who slotted a rather soft goal past Shrimpers keeper Mark Oxley to put his side in front. By the end of the first half the Sky Blues looked in full command, with Southend struggling to break them down and home boss Powell rang the changes for the second half, reverting to a flat back four as left back Ben Coker made way for midfield man Bunn. And not long after the hour mark, a further substitution by the Blues chief soon had a big impact. Hopper replaced Robinson up front, and within six minutes the pacy summer signing from Scunthorpe had been set up by fellow striker Simon Cox, then he outfoxed the Coventry defence before firing a low left footed equaliser into the right hand corner of the net to make it 1-1. A happy Hopper had netted his seventh goal of the campaign so far, but Southend’s joy was to be short lived. With 11 minutes remaining Cox, booked for a foul five minutes previously received his marching orders after receiving a second yellow card. Worse was to follow for Blues once the game entered the four minutes of stoppage time added on by referee Whitestone. In the 91st minute Coventry substitute Jodi Jones put in a low cross, which was deflected off home centre half Michael Turner and into the back of the net, sparking wild celebrations among the visiting fans who numbered nearly 1000. The Shrimpers threw everything into trying for an equaliser in the dying seconds, Oxley going forward and the shot stopper wasn’t far away from scoring before a follow up effort from Stephen Hendrie sailed a long way over the bar. So a decent run of league results came to a disappointing conclusion for Southend, as they dropped to 12th place but they are back in EFL action this Tuesday night, when they will look to get back on track as Walsall visit Roots Hall. 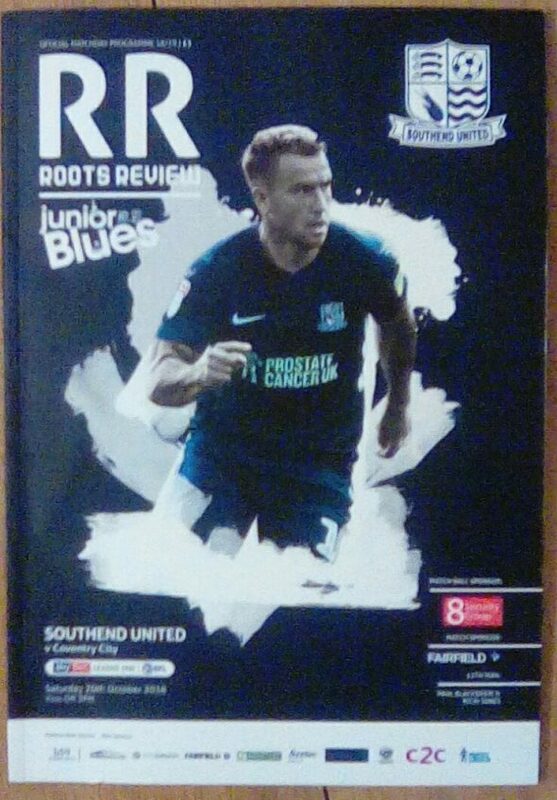 Southend United: Mark Oxley, Elvis Bwomono, Taylor Moore, Michael Turner, Stephen Hendrie, Ben Coker (Harry Bunn 46), Sam Mantom (Jason Demetriou 78), Timothee Dieng, Dru Yearwood, Simon Cox, Theo Robinson (Tom Hopper 62). Coventry City: Lee Burge, Dujon Sterling, Jordan Willis, Tom Davies, Junior Brown. Luke Thomas,Michael Doyle, Tom Bayliss, Jordy Hiwula (Jordan Shipley 76), Jonson Clarke -Harris (Amadou Bakayoko 89) Conor Chaplin (Jodi Jones 84).